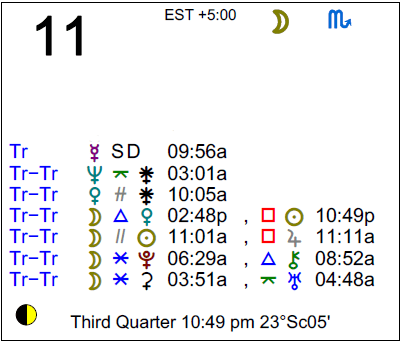 Mercury comes to a direct station this morning, ending a three week retrograde period. Stations always magnify or exaggerate the energies of the planet, and this can lead to mistakes as we don’t see the full picture, so it’s best to avoid major decision making today. It’s also important to try to avoid over-thinking to the point that our intuitive insight is ignored, and avoid focusing on the mechanics or superficial elements of communications so much that we fail to see intention. The Last Quarter Moon tonight can stimulate awareness of intimate needs that we may have been ignoring. The Moon is in Scorpio all day (until Thursday, February 12th, at 11:46 AM). 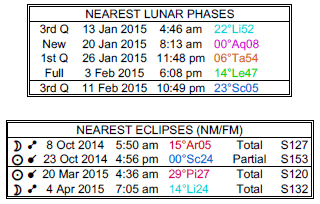 The Moon is in its Waning Gibbous phase / Last Quarter phase from 10:51 PM forward. Last Quarter Moon occurs at 10:51 PM. Mercury’s three-week retrograde period comes to an end today, dear Aries. Communications can remain confusing as Mercury changes direction, and perhaps even more so, before they begin to clear up. Even though today may be a little chaotic due to a tendency to over-think, this shift in direction can bring improved relations with friends and associates over the coming days and weeks. You are likely to dwell much less on the past, and to take more interest in making the most of what you have in the present. Plans that might have recently stalled could be resumed or scrapped – either way, it’s no longer up in the air and a decision can be made. Mercury comes to the end of its three-week retrograde period this morning as it stations direct, dear Taurus. Over the coming days and possibly weeks, you can experience more clarity with long-term, career, or life-plan goals, as well as with your personal finances or valuables. Work projects or responsibilities can resume normal speed or pick up pace. Relationships with bosses or parents and with the public can improve. For now, however, while the shift occurs, we can be especially error-prone. Avoid situations where you may misrepresent yourself, or aim to be as clear as you can. There is a tendency to be error-prone today, dear Gemini, with Mercury, your ruler, stationing before turning direct after a three-week retrograde period. This shift of directions can magnify problem areas. It can also mean you’re tuning in far too much to the details and facts of a situation, so much so that intuition takes a back seat and leaves you with less resources to make good decisions. Wait things out, if possible. Over the coming weeks, more clarity is likely in many areas of your life, and you can experience renewed confidence in yourself and your plans, as well as faith that life will supply you with what you need. There is definitely such a thing as too much information, and when Mercury stations as it does today, it might lead to errors if we push decision making, dear Cancer. After three weeks of retrograde motion, Mercury begins direct motion this morning, and over the coming days and weeks, you’re likely to come to a clearer sense of what you want to do and where you want to go, particularly in an intimate relationship or concerning finances and support systems. A complicated matter may now begin to unravel. Some plans you’ve made recently may now seem less important or even necessary. Today, however, avoid jumping to conclusions and jumping into action, as you may not be in touch with your intuition, temporarily focusing too heavily on superficial information. Mercury is ending its retrograde cycle today, dear Leo, and over the coming days and weeks, relationship endeavors, and relationships themselves, should resume “normal” speed. Friendships might also gain more clarity. Even so, while communication problems are likely to clear up soon, this won’t magically happen all at once. Be patient as recent problems begin to unravel in the coming days. Communicating with partners, and getting a clear understanding of where a partner stands, should be easier going forward, slowly but surely. Misunderstandings are still possible today, so take things slowly. Enjoy the upbeat energy of the day, miscommunications aside. Tonight, circumstances may be such that you gain new insight into a partnership or family matter. Over the coming days and weeks, you’ll find that some plans or projects that have stalled begin to move forward, dear Virgo, with Mercury ending its retrograde period and turning direct today. Work projects that have stalled are likely to resume “normal” speed. While you should still be a little more careful in your communications today, and you should keep an extra eye on details that could be missed, more clarity is on its way in your work and with your health. Not all information is available to you at the moment, but some of the excess “traffic” clearing can help you feel more in command. For today, be as clear as you can in your communications, as we’re in a transition period. Save your energy. 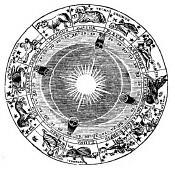 Mercury stations today, dear Libra, as it changes direction – from retrograde to direct. While today and tomorrow may be a little chaotic, this shift in direction can eventually bring improved communications and more clarity in romantic as well as work matters in the coming days and weeks. Indecisiveness tends to clear up and disjointed ideas and projects come together. With the shift occurring today, some confusion remains. It’s best not to focus superficially on what is or isn’t said, and instead to have patience as problems unravel. Choose not to react too quickly to communications. Creative or romantic affairs, and possibly matters related to children, that have been stalling or stuck will begin moving forward. There can be less concern about the past and more inclination to live in the present when it comes to pursuing your passions. We’ve come to the end of Mercury’s retrograde, dear Scorpio, and this can point to improved, or at least clearer, communications with family in the coming days and weeks. While you’re unlikely to see immediate results today, and in fact misunderstandings can be pronounced now at Mercury’s station, you can look forward to more clarity in your relationships soon. There is less focus on the past and more forward-looking energy in your life. In the coming days, plans or projects that you left on hold or that seemed to stall begin to make more sense and move forward. Recent ideas and revelations might start to come together now, while others might be scrapped if you’ve re-thought their viability. With the planet of communication, Mercury, shifting directions from retrograde to direct, you’ll need to be especially sensitive when it comes to choosing your words to express yourself, dear Sagittarius. Many recent misunderstandings are likely to clear up in the coming weeks, but any transition or station has the effect of magnifying problem areas. It’s important to avoid focusing on superficial elements of conversations or the trivial side of matters. Conserve energy now. Over the coming days and weeks, you may be returning to previous conversations, projects, and interests that were confusing or that stalled, now with new insight. After three weeks of retrograde (or apparent backwards) motion, the planet of communication, Mercury, is resuming direct motion this morning, dear Capricorn. This means that over the coming days and weeks, things seem to move forward at regular pace, particularly when it comes to finances, personal possessions, work, and income, and you can suffer less from indecisiveness. Business projects that were unfinished or put on hold might resume, after making important edits and refinements. You are clearer about what you want to do and where you want to head. However, with any station (Mercury stations today), misunderstandings tend to be pronounced. It’s a transition day, so conserve energy and observe rather than take decisive action with important matters. Mercury turns direct this morning after three weeks of retrograde motion, dear Aquarius. While this is a signal that communication problems will be unraveling and clearing up, we can’t expect it to happen in a day, and in fact, there can be a temporary magnification of problem areas right now. You are likely to be clearer as Mercury moves forward in your sign. You begin to feel more in step with others and your personal environment. Problems expressing yourself or feeling misunderstood can also clear up in the coming days and weeks. Today, however, take extra care when communicating and avoid focusing on the superficial elements of conversations, situations, and systems, which is a strong tendency when Mercury stations as it does today, and which can lead to errors. The planet of communication, Mercury, ends its three-week retrograde cycle this morning, dear Pisces. This means that over the coming days and weeks, communication problems will tend to resolve and a partnership may begin to move forward if it’s been in a slump. However, with the shift occurring right now (Mercury is at a station as it changes directions), there can be some confusion and possibly frustration with missed or confusing directions or a tendency to focus too heavily on superficial elements of plans and communications to the point that intuitive sense is ignored. Recent introspection and intuitive insight can be put into action in the coming days and weeks, although you’re still very much inclined to keep to yourself and to hold off on important decisions while Mercury continues to transit your privacy zone until March 12th. If Your Birthday is February 11th, If Today is Your Birthday full horoscope here. There may be slight changes in relationships that have us concerned or feeling out of sync, although these may very well be changes in our perceptions (we may see elements that we previsously idealized in a partner in a less flattering light, for example). If we’ve been making too many sacrifices in a partnership, this can be an issue now. You have a tendency to be apathetic and self-indulgent, preferring to ride on the camel’s back as it is more fun. You need to learn self-discipline to achieve your goals. You are restless and find it difficult to settle in one place. Your larger-than-life ideals stand in the way of you achieving your goals. Your challenge is to find a balance between stability and adventure. Then you will be able to reach all your goals. Moon 06° Capricorn 08' 35"
Mars 15° Gemini 54' 20"